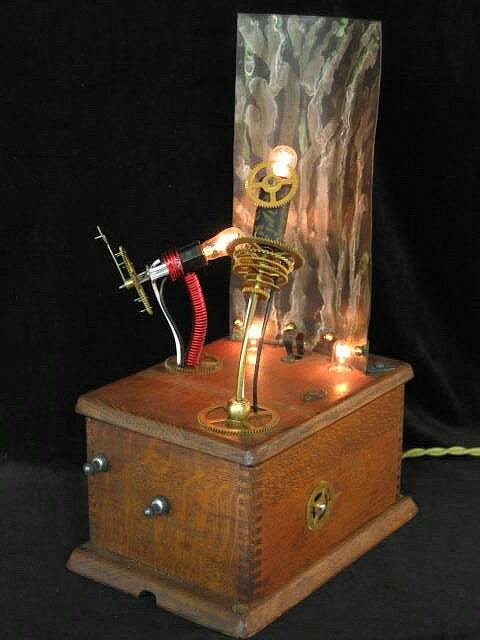 This is my Steampunk lamp Diabolical Box #11. I call this one my Bug Light since the sockets and bulbs look like little bugs to me. This is a very early box from when I was doing a lot of experimentation with different forms. It has been on display for the last two years and I finally got it back. First time for sale. The box is an vintage telephone ringer box. The gears are vintage clock gears. The plate in the back is a copper plate I treated with solder and chemicals. On the side is a plate with the box number. My signature and the date 2011 are carved into the bottom. Base: 6 1/2” X 9 1/2"